The blue Hawaiian cocktail is a fantastic and fun tiki drink. It's filled with rum, pineapple, and coconut and, best of all, it's blue. There's something alluring about blue cocktails. They're exciting and exotic and they're almost always tropical, which is exactly why people love them. The blue Hawaiian fits all of these descriptions perfectly. The blue color also lends itself to its other nickname, the swimming pool cocktail. In essence, this is a blue version of the popular pina colada. It simply splits up the coconut and pineapple flavors to allow room for the blue curaçao liqueur, which is an orange-flavored liqueur that is responsible for the drink's color. You have two options when it comes to mixing this tropical summer cocktail. Shake it or blend it up, either way, it's a very easy one to make. Garnish with the cherry and pineapple - a little paper cocktail umbrella is optional, but super fun. For the frozen version, simply pour the ingredients into a blender with 1 cup of cracked ice. This will be enough for two drinks, so be sure to share it with a friend. It is easy to confuse the blue Hawaii cocktail with the blue Hawaiian cocktail. 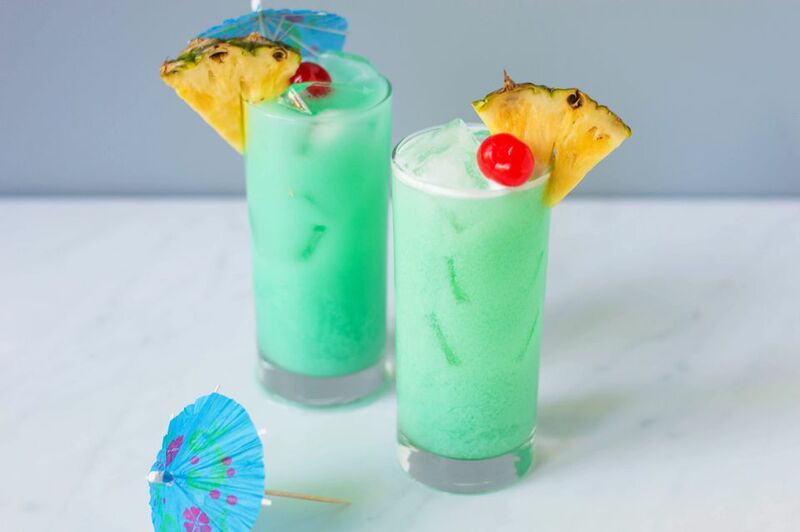 While both are blue due to curaçao liqueur, the blue Hawaii cocktail is made with sweet and sour mix instead of creme de coconut. If you see creme de coconut or a coconut-flavored rum suggested, you are making a blue Hawaiian cocktail rather than a blue Hawaii cocktail. The blue Hawaiin was first made by bartender Harry Yee at the Hilton Hawaiian Village in 1957. He was asked to develop a drink based on curaçao liqueur by a sales representative for the distiller. It was further popularized as a tropical drink at tiki bars such as Trader Vic. How the blue Hawaiian cocktail came to be is lost in history. Certainly, your guests may have the two drinks confused, so you may need to clarify what it is you are serving. If you are a cheeky host, you may keep some puns handy on what could be making Hawaiians blue. How Strong Is the Blue Hawaiian? Assuming that you pour an 80-proof rum for your Blue Hawaiian and follow the recipe exactly, it will delight you to know that this fun tiki drink is not so boozy. It's actually surprisingly light at right around 15 percent ABV (30 proof). If you toss it into the blender, you will have an even softer drink that's around 6 percent ABV (12 proof).